Installing a LAZY-HAND hand grip for phones and tablets is simple. Follow these instructions to properly place the grip on your device. If necessary, trim adhesive-backed loop sheet to appropriate size before applying. Clean area on the back of the device with cloth and alcohol-based cleaner like Windex. Cover any inlaid logo area with a small square of paper or tape. Peel backing from adhesive-backed loop sheet on phone grip. Center sheet(s) and stick onto back of mobile device. Apply LAZY-HANDS® hook-backed finger grips to loop sheet where comfortable. 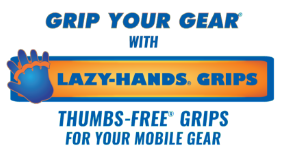 Enjoy using your LAZY-HANDS® tablet or cell phone hand grip. The adhesive-backed loop sheet is meant for single use only. LAZY-HANDS tablet and cell phone hand grips are not designed for use on items over five pounds and only intended for lightweight use. There is no warranty for misuse or items dropped. Before applying the adhesive-backed loop sheet, clean the area with a cloth and alcohol-based cleaner like Windex, cover any inlaid logo area with small square of paper to prevent adhesive from contacting it, and lift it when the adhesive sheet is removed. Do not cover any ventilation areas, speaker holes, or cameras. If the adhesive-backed loop sheet is to be removed, start from the corners and pull very slowly. Adhesive is strong and will be difficult to pull away from mobile devices. Adhesive will not adhere to silicone or porous materials.